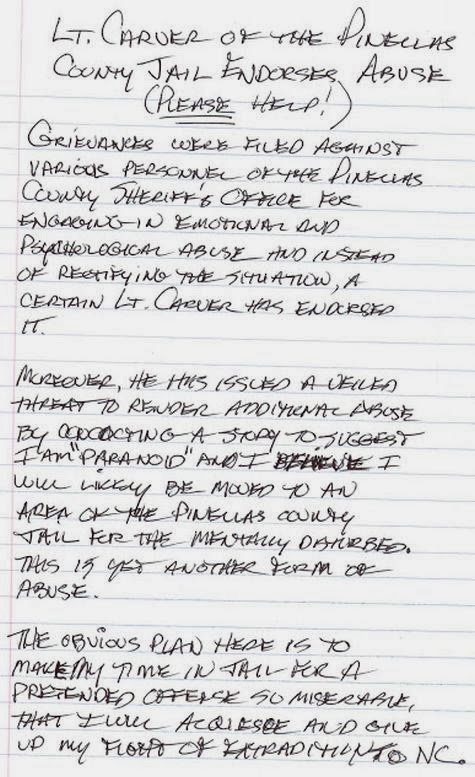 Officials of the Pinellas County (FL) Jail regularly engaged in emotional and psychological abuse of Spencer C. Young, as described in his below hand-written clarion call for help. Mr. Young was arrested July 3, 2012 by a SWAT Team of US Marshals on entirely fabricated charges (that were later dismissed as meritless) and then unlawfully incarcerated in Pinellas County Jail, as he fought a pending fraudulent extradition to Durham NC. The "Lt. Carver" referenced in the below transmittal pertained to a "Lieutenant Carver", who was responsible for the section of the jail Spencer C. Young was detained at. 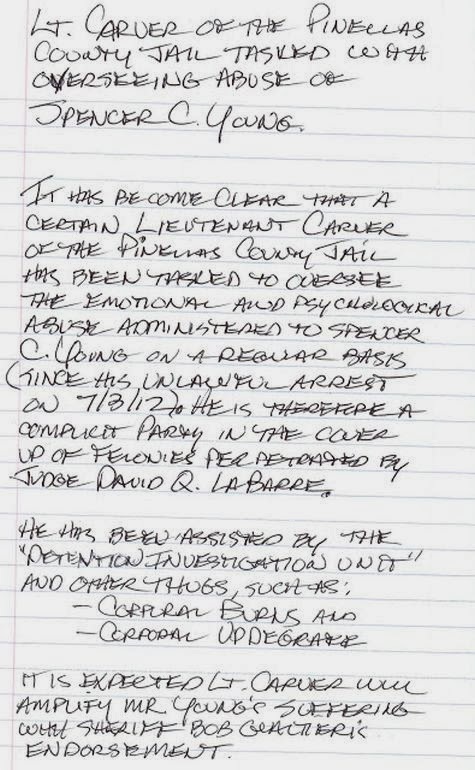 Other corrupt officials who played a complicit role in Mr. Young's abuse included "Corporals" UpDegraff and Burns, as well as numerous "thugs" in the "Detention Investigation Unit" or "DIU", whose real role is to cover-up the abuse of inmates housed at the Pinellas County Jail. This abomination of American civil liberties was an effort to cover up the extensive felonies of Durham Judge David Q. LaBarre and his girlfriend, Leah R. Krier, which was coordinated by LaBarre's long-time friend and colleague, the woefully corrupt Durham District Attorney, Leon Stanback. This was just one of the many elements in the cover-up of the LaBarre Larceny Scandal. Note: The below notice was written by Mr. Young while unlawfully incarcerated in maximum security jail. It was then secretly given to the private investigator he had hired, who in turn posted it on this website and transmitted it separately to selected public officials. At the time, the only viable defense to the diabolical plans against Mr. Young was to expose them BEFORE they were carried out.